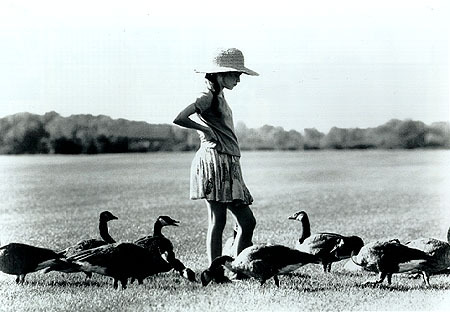 A warm and sensitive tale about a young girl and her geese. A car crash has prematurely bereft Amy Alden (Anna Paquin) of her mother and she winds up going to Ontario to live with her estranged father Thomas (Jeff Daniels). Dad, as it turns out, is a wild and fascinating artist/inventor who is really a regular guy, but could be considered slightly eclectic, if not eccentric, in certain circles. Amy's new life and surroundings, which include relating to her dad and his girlfriend, prove a difficult transition for the thirteen-year-old. The unexpected discovery of a nest of orphaned goose eggs in the barn become a crucial turning point in her life. She nurtures them, watches them hatch, and cares for the goslings who have, according to their nature, imprinted her (since she was the first creature they ever saw) on their minds as their mother. Columbia Tristar film distributors international. Realizing that these little birds are the first things that have made her happy since her mother's death, her father does all in his power to help her keep and enjoy them. Upon discovering that it is illegal to raise wild geese domestically, however, without clipping their wings because of the potential danger of spreading disease among wild flocks, the family is confronted with a serious problem that can only be solved by teaching the birds how to fly. The magnitude of the problem demands dedication, hard work, and ingenuity to deal with it properly. A vast number of complicated and fascinating technical problems had to be taken into account previous to the making of the film. A special aircraft, for one example, with extra long wings had to be designed not only because feature film cameras are too large and heavy for lightweight aircraft, but because geese fly at 32 mph which is stalling speed for most aircraft. The aerial acrobatics necessary, once in the sky, for the realization of the sequences are also incredible. There were five basic aircraft on the picture: a bi-wing foot-launched glider with no motor, a bi-wing foot-launched underpowered unit and its equivalent with a larger motor, a bi-wing with tricycle landing gear, and a kite-winged goose trike (as well as a helicopter to film the aircraft). As far as the incorporation of a father/daughter relationship to create audience interest, Lishman admitted during the planning stage, '...that's nice, but I think visually it's going to be fabulous because we'll be able to share that image of the birds, that point of view of flying with them. A lot of people are going to enjoy that image no matter what the story.' And how right he was: the film is truly breathtaking, especially the sequences with birds in flight and co-ordinating with their human assistants. The story, although captivating, matters less because it is through the images that the viewer's heart is raised high and flying with a glow. Though touching the film may be, it also contains more important implications. From an ecological standpoint, it shows and shares how important an activity like saving an endangered species is. It reminds one how much less important so many other activities in our lives are by comparison. Superb points for Lishman and his wonderful story (what a guy!) as well as the direction of Carroll Ballard and breathtaking cinematography of Caleb Deschanel. Many takes were shot at 'magic hour' and this enhances the stunning beauty of the images. And, of course, let us not forget the magnificent geese. Keep watching the skies.